A year ago I got sick - crazy, excruciating pain, ER kind of sick. After a couple of long visits to the local hospital, I was referred to a specialist in Chicago. Several x-rays and CTs later I received the diagnosis from the surgeon. I had a slow growing cancer. He told me and my husband, Bobby, that we should go to MD Anderson cancer center in TX so that I could be close to my parents. He said I would need the support. It was such a surreal few weeks - that gray time last October. One moment stands out to me very clearly, though. I was in the shower (the only relief from the pain occurred if I stood - slightly bent - under scalding water). I remember saying to Bobby, "Do whatever it takes." What I meant was, "Do whatever you need to do so that we don't have to live like this any more." The thing is, I wasn't referring to the pain, the diagnosis - or anything concerning my crazy condition. It was as though the illness itself was a magnifying glass - allowing me to clearly see the ridiculous way I'd been living my life. Right then-as the hot water began to run out - and the pain escalated, I knew things had to change. It's tough to explain how exactly I'd been living - or what what so ridiculous about it. To an outside observer, the problems may have been undetectable. How do you know when someone's just crossed that line - the line that separates a righteous thought from a sinful one? Or even a sinful act - how do you know when a day shopping with friends crosses over to greed - or sharing a meal turns to gluttony? For me the problem was subtle - but quite real and destructive. It was a non-spoken mantra (kinda like in DH Lawrence's Rocking Horse winner) I needed to be more. Thinner, richer, better job were some of my ambitions - but there were "good" ones too - better mom, cleaner house, "better Christian." It's not like I consciously acknowledged these goals - also - it's not like I was "succeeding" in any of these areas. I mean - you'd think I was Sarah Palen or something. No, the ambition manifested in silly ways throughout my day - trying to be just a bit busier than my time would permit, live a slightly more expensive lifestyle than my budget could allow, be a little bit thinner than was comfortable for my body. And living like this for the past 20 years was about to kill me. It turns out that I didn't have cancer. A week at Mayo clinic revealed that I had a benign swelling of tissue - quite a wonderful diagnosis to hear in comparison to the first. So I lived for several months in sortof a dream state. Like Scrooge on Christmas Day. I was so greatful to be alive and not going through chemo. But this afternoon- a year later - I became overcome with thanksgiving again. Not because I didn't have cancer - but because that crazy perfectionism that had eaten away at my soul for so many years had been shattered. 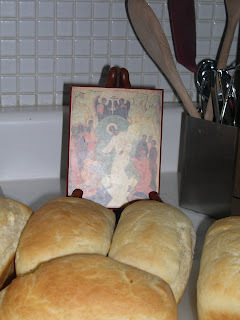 This afternoon as the crisp fall air energized me, I cleaned my house made some bread. Let it be clear - I am not bragging here. Many people everywhere clean their house and make food. Many days I did these exact tasks - pre illness. It's just that it felt so different today. Today I wasn't panicked or rushing or trying to suddenly wash windows/curtains/clean out the garage and other manic tasks in addition - I was just living. I think you'd call it peace - and it felt amazing. Wow - just reading that brought back a flood of memories. As your family, I had never known such fear nor cried as many tears as when I first heard the news. What a difference a year makes! I am frequently asked at CTS how you are doing; if you are in good health. And each time I am reminded of the incredibly amazing joyous miracle of your diagnosis. Thank you Carrie - the outpouring of love and prayers was/is overwelming. Love you! Paige- so beautiful and wonderful. Love to you. To remain thankful...you are on the right path, dear Paige -- may you continue with God's help. This is beautiful! A totally refreshing read . . . I only wish we could chat in person. But I am so glad to know your blog is here and I can check back!